Wonderful, antique, Edwardian Era, 14k yellow gold and amethyst necklace, bracelet, ring set. The necklace is 14.5" long plus 1 7/8" long pendant. Bracelet with 3 amethyst stones is 6 3/4" long x 3/4" wide. The size 7 ring has carved amethyst with 3 small rose cut diamonds. Top of the ring measures 15mm x 12mm. Condition of this beautiful antique set is very good. Weight is 20.3 grams. 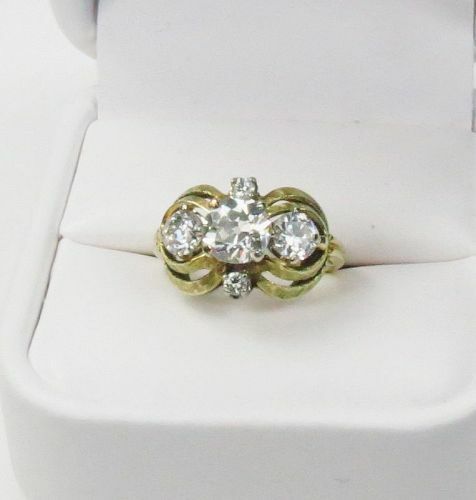 Absolutely gorgeous, antique, 14k yellow gold and 5 diamond engagement ring. Top of this size 4.75 ring measures 3/4" x 1/2". Ring consists of approx. 1.8ctw of I-J color VSI1-2 clarity diamonds. 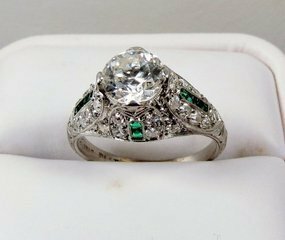 This amazing ring is in excellent antique condition. Weight is 4.97 grams. Antique, Edwardian Era, wedding ring, composed of 18k white gold, 0.35ctw natural sapphire and 2 diamonds. Top of this 7.5 size ring measures 17mm x 8mm. The ring consist of approx. 0.20 ct of diamonds. Condition of this antique ring is very good. Gold is marked 18k. Weight is 7.3 grams. 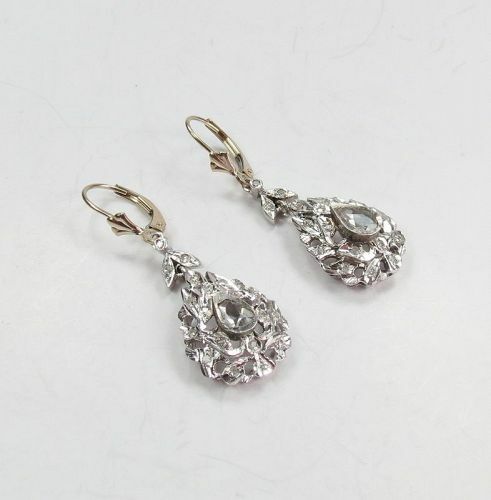 Antique, 18K white gold and old cut pear shaped diamond dangle earrings. The antique earrings with newer tops are 1 5/8" long x 5/8" wide. In very good antique condition. Each earring consist of one 8mm x 6mm old cut diamond with a light blue color to them and 10 pave diamonds. Total weight of diamonds is approx. 1.20ctw. Beautiful, antique, Edwardian Era 14k/18k white gold, natural ruby and diamond pendant with newer 14k gold chain. Necklace is 16" long, pendant with approx. 2ctw natural ruby and approx. 0.45ctw diamond measures 1 1/2" x 1/2". Necklace is in excellent pre-owned condition. Weight is 6.36 grams. Antique, Edwardian Era, 14k white gold, camphor glass, diamond filigree necklace. White gold chain is 15" long, filigree pendant measures 1 5/8" long x 3/4" wide. Necklace is in excellent pre-owned condition. Gold is marked 14k. Weight is 3.5 grams. Absolutely amazing, antique pendant composed of 14k yellow gold, natural rubies, seed pearls and diamonds with 18k gold chain. The pendant/pin measures 1 3/4" long x 1" wide, it consists of 4 natural rubies, 2 diamonds, four 4mm pearls, 7mm dangle pearl and many seed pearls. The 18k gold chain is 15" long, it is marked France 750. Brooch/pendant has worn off makers marks. This beautiful necklace is in very good condition. Weight is 9.1 grams. 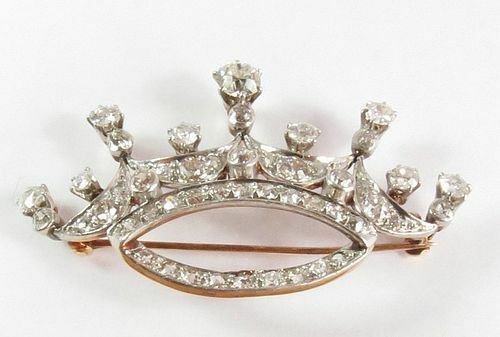 An amazing, antique crown pendant, pin composed of 14k gold and approx. 2.8ctw diamonds. This wonderful pendant measures 2" x 1 1/8". The diamonds are H color and VSI clarity. Pendant is in very good condition. It weights 9.1 grams. 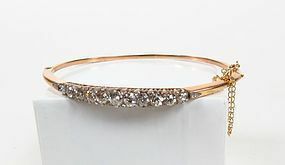 Beautiful, antique, 14k rose gold diamond bangle bracelet. This elegant bracelet consists of approx. 1.8ctw of rose cut diamonds, H color, VSI clarity. Measure 2 3/8" x 2" in diameter. Front of the bracelet is 5mm wide. Weight is 12.2 grams. This elegant bangle is in very good antique condition.